Discover the new discounts of Lowe’s Ad on this page. Lowe’s is a home improvement store that publishes weekly deals on some of the products through the Lowe’s Ad which can showcase brilliant home products, gardening tools, hardware and power tools, kitchens, heating and cooling, and many more categories. 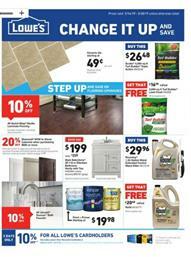 Check this page for the new deals of the Lowe’s product range. Moreover, you will be learning if they offer free assembly or delivery for the purchases you make. Installation of carpet or assembling furniture or other kinds of home products might be tricky. Save time and money with special deals from the weekly ads. There can be two weekly ads; one is for professionals and other is for general products. If you have DIY projects or are repairing something, bulky buys might do a good saving for your budget. Lowe’s is operating with more than 2300 stores in North America. It’s one of the largest hardware and home improvement chain. They almost doubled the number of stores in the 2010s. Find modern solutions to the problems caused by seasonal transition or the requirements of your garden. Lowe's Ad has a wide range of products with practical solutions to anything. Professional hardware like DeWalt combo kits, gardening products, and gardening mixtures such as weed killers, lawn food are available in the latest Lowe's Ad. There is also a new one with a lot more deals for different categories. You can also buy grills at Lowe's stores for a lower price today. Advantage 4-burner gas grill is only $169. Embellish your garden with beautiful plants. You can subscribe to the newsletter to get emails. Or follow us on Facebook.